You’ve had an excellent dinner with roast sweet potato the previous night but found you have about 1/2 a large sweet potato left over, what to do with it ? Whack it in the fridge and make pie in the morning of course! * approx. half a large sweet potato, peeled, sliced and baked. Grease a deep pie dish with butter and line with one sheet of puff pastry. Set aside the half sheet for later. Pre-heat the oven at 200C (fan forced, top and bottom element, shelves on bottom and middle positions, place a pizza stone on the middle shelf). In a mixing bowl, mash the sweet potato, add the other ingredients of Filling 1 and mix until you form a smooth paste. Transfer this to the pie dish and smooth out. Not in the same mixing bowl, add the ingredients of Filling 2 and whisk into a batter. Pour over the top of Filling 1. 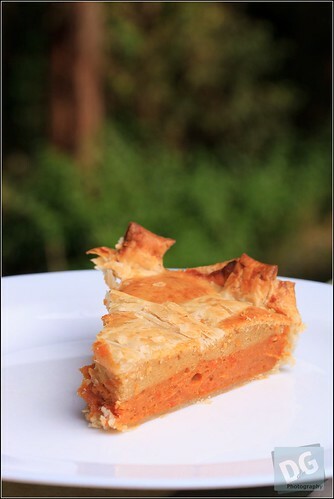 Slice the half sheet of pastry into strips and lay as a lattice on top of the pie. Bake for 30 minutes on the bottom shelf of the oven. Test with a skewer, serve warm with ice cream.